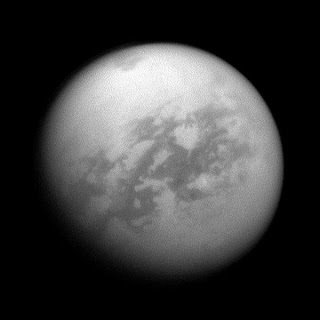 SpaceNewsNow: Could Titan's seas harbor life as we don't know it? Could Titan's seas harbor life as we don't know it? MSNBC's Alan Boyle speculates on the possibility of Titan's seas harboring life as we don't know it. "A fresh photo from the Cassini orbiter shows the hydrocarbon-rich seas and dunes of Titan, a Saturnian moon that might be capable of sustaining life as we don't know it. The picture, published today on the websites of NASA's Saturn mission and Cassini's imaging team, shows the huge sea known as Kraken Mare as a dark spot on the northern edge of Titan's disk. The dark Senkyo dune field is front and center. Cassini's narrow-angle camera captured the view in near-infrared wavelengths from a distance of 1.2 million miles (1.9 million kilometers) on Sept. 14."